After more than two decades, the 911 is finally given its first true redesign. The 964 was the first real redesign for the 911, but it was most certainly a major one. Changes to the original 911 had been more incremental, and none of them were what you&apos;d really call a whole new generation. Then came the 964, and according to Porsche, 85 percent of the car was new for this generation, hence the new type designation. As with subsequent generations of the car, when the first 964 debuted in 1989, there was only one variant of the car available. Surprisingly, this was the Carrera 4 version, a naturally-aspirated 911 which was also, for the first time, all-wheel-drive. True, the 959 had been all-wheel-drive, but the 959 wasn&apos;t officially a 911, rather it was a car based on the 911. Much of the thinking from the 959 went into the 964, such as the AWD system, but a surprising amount of technology which Porsche had developed for the 959 wouldn&apos;t end up on the 911 until the Type 993 came out. Aerodynamics was one of the things which received the attention of designers though, and the 964 got the 911&apos;s coefficient of drag down to 0.32. The Carrera 2 964, a rear-wheel-drive version of the 911, came out in 1990. Both the Carrera 4 and the Carrera 2 were offered as either hardtop, Cabriolet or Targa. Though later generations of the 911 would offer Targa models, these were glass roofs, whereas the 964 Targa still used the traditional removable roof setup. The engine was increased in size to 3.6 liters, and it was still air-cooled. 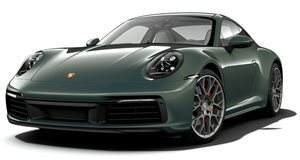 It now produced 247 horsepower in N/A form, and for the first time, Porsche would offer it with a Tiptronic automatic transmission. The 964 Turbo would replace the 930 in 1990, but only sort of. Most of the car was new, but Porsche hadn&apos;t yet developed a turbocharged version of the new 3.6-liter engine. The engine they used was therefore just a slightly tweaked version of the 3.3-liter unit from the outgoing 930, which was slightly more powerful and had slightly reduced turbo lag. In 1992, Porsche made the first Turbo S variant of the 911, but only for one year. The Turbo S was lighter than the standard Turbo and produced 376 horsepower, compared to the 320 horsepower of the standard Turbo. The 964 Turbo would finally get a 3.6-liter engine in 1993, but this was right at the end of the 964 production cycle and very few were produced. The new engine produced 360 horsepower, and surprisingly little of it would end up carrying over to the 993. High performance versions of both the Carrera and the Turbo were built, but only the Carrera models were street legal. This was the Carrera RS, a nameplate revived after the super-exclusive Seventies homologation models. These RWD-only models were stripped of many creature comforts and used lightweight replacement parts, saving a total of 345lbs overall, as compared to standard Carrera 2 models. The engine was tuned to produce 260 horsepower, the brakes were upgraded, and the suspension was changed to a more track-focused setup as well. Typical of many German automakers&apos; attitudes towards Americans, Porsche initially decided that the US market wouldn&apos;t be interested in the RS, and didn&apos;t offer one on this side of the pond. When US 911 devotees objected, Porsche relented and made an RS America edition. The car got new wheels and suspension, but no changes were made to the engine, transmission or brakes. Porsche deleted the power steering, but little else, and in the end, this less-powerful version of the RS was just 77 pounds lighter than the standard car. Somewhat more impressive was the Turbo S LM-GT. This was a race car based off of the Turbo S, but with a different engine. The engine was a smaller 3.2-liter twin-turbo unit which produced 475 horsepower. This car incorporated elements of the 959 as well as the 935 race car, and was the predecessor to the Type 993-based GT2. The "LM" in the name stands for Le Mans, and the car would compete at La Sarthe as well as a number of other endurance racing events. The car performed adequately, and was upgraded in 1994. Porsche had moved on to the Type 993 for their road going 911 models by this point, but the Turbo S LM-GT used a 964 chassis and a 3.6-liter twin-turbo version of the 993&apos;s engine. It would then be replaced in 1995 by the fully-993 GT2. Confused yet? It will only get worse. The 964 represented a new era in the 911, where Porsche had previously been happy to evolve the 911 slowly over time, they had now come to realize that major redesigns would be needed every few years if they expected to stay competitive. The 911 had become a sports car icon, and that meant that every other sports car maker was howling for its blood. The 964 showed Porsche&apos;s ability to adapt to this new situation.